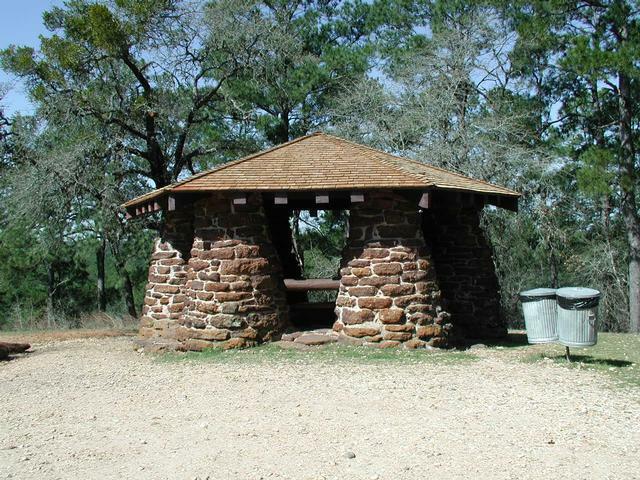 Many Bastrop State Park hikes start near this gazebo. Getting there: From Austin head east on Highway 71. Take the Loop 150 exit and continue east to the intersection with Highway 21. The entrance to the park is in the middle of the Y-split in the road. Fallen pine needles sometimes obscure the trail, but the park's blazes on the trees help point the way. The Hikes: The Lost Pines of Bastrop State Park provide a refreshing change from the rocky Cedar and Oak trails common farther west in the Hillcountry. Here a small island of Pine forest resides, separated from the main Eastern Texas Pine forests by 100 miles. The sandy soil of the area encourages the Pine's growth despite the drier conditions here that normally preclude Pines from developing. A thick Pine forest means lots of shade, and you'll get that here. Underneath that shade you'll often benefit from a blanket of pine needles on top of loose soil. At times it's like walking on a mattress. 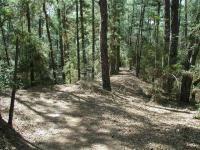 The trails through the Pine forest provide some unique hiking opportunities in the Hillcountry. 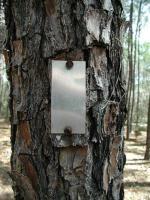 Bastrop State Park is THE place to visit if you are interested in Orienteering. The park contains a large number of permanent orienteering "flags". A orienteering map is available for a nominal fee at park headquarters pointing out their locations. 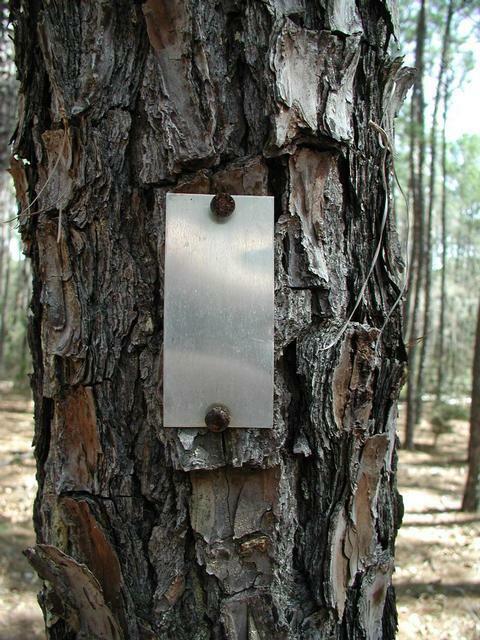 The park is also host to a yearly orienteering competition organized by a group out of Houston. There are not too many places where one can golf in a state park, but this is one of them. The entrance to the park cuts through the public course. Other amenities include ample camping areas and a pool. The only trails open are those inside the former Park Road 1A loop. Park Road 1A is now a C shape instead of a full loop, with the side near the former lake closed. These "interior" trails are in good shape, with a nice variety of open views and enclosing vegetation. Pine saplings are up to 12-15 feet tall in places, and there's a lot of plants I don't remember ever seeing in the park before. After a couple months of good rain everything is very lush. The golf course closed down a year or so ago, and the cart paths are open for walking. This is rather flat, roughly paved, and the place where I saw the most wildlife. Lots of woodpeckers. You have the feel of walking through wild meadows scattered with mature trees. These golf cart paths also made up the bulk of the 5 miles I hiked. All in all, it was lush green, but if you looked through the plants you saw fallen branches and logs all over. There were just a couple places where isolated stands of pine trees remained from before the fires, and lots of places where burned trunks rose above the greenery like strange totem poles. 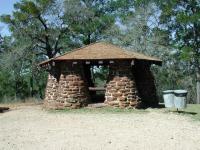 Bastrop State Park was affected by a fire in September 2011. I thought the park was merely temporarily damaged, much like what happens with a prescribed burn. What I found, however, was the trees in the park were nearly destroyed. In fact, 98% of the trees burned and even though I hiked this park over 1 1/2 years after the fire, it still looked like a war zone. It was very depressing because I could tell that this park must have once been very beautiful. Paradise lost... It is bouncing back slowly, but it will take many years to get back to its previous state. The trails are color-coded, generally well-marked and the map provided by the Park HQs is pretty good. There are a lot of small hills and valleys that give you a little cardio work. The trails themselves are in need of maintenance as there were a LOT of fallen trees blocking the trails (Note: I went at a time when the winds were pretty strong (15-25 mph), so it's possible many of the fallen trees were recent victims). Park rangers were out with their chain saws doing what they could. The Purple Trail (aka Lost Pines Hiking Trail) is partially closed at the present time. You can only go as far as Harmon Road. The section east of Harmon Road is closed. This park has nice campgrounds. I had planned to camp at Creekside, but given the combination of dead trees and high winds I decided not to. If it had not been so windy, I would have liked to camp here. Fellow hikers, this park needs our help, so I encourage everyone to visit this park as the funds are sorely needed. Took the red trail. Lots of huge trees. Not a lot of variety, creek was dry, but being out in nature was worth it. Lots of people for the remoteness and the season. If we had to do it again we'd park on the road that cut through it and done 4 miles the first time...one of our few 7 mile hikes! Park pass sounded like a good deal but we have 2 different cars and you cant transfer it. This is probably one of my favorite places to hike in the area. Lots of nature and wildlife with varying terrain. If you go in the spring, look for baby frogs around the pond area. Rates are now $4 entry to park and the map isn't quiet acurate. A lot of the trees are marked and there are lots of maps when the trails change names. The paper map has different color code for the different types (elevations). Nice and wide most of the time, we did the blue trail which ran into the red trail when heading back to the car. It didn't, instead it runs into the gray trail that will run into red, then the white where we parked. Saw very few campers in the wilderness section or hikers. Good trail when hot, but can see how the drought has kept the man made waterfalls dry and the lake looked very low. My husband and I started at the overlook the first time that we did this hike, but we found that if you take Park road C towards Buecher and turn down Hammond road to the right that you can park at the trail there and begin the hike in solitude. This is one of the most peaceful hikes I have been on. At times all you can hear it the wind in the trees. It's wonderful.